Sometimes called the unicorn whale, narwhals have only two teeth, both in the upper jaw. 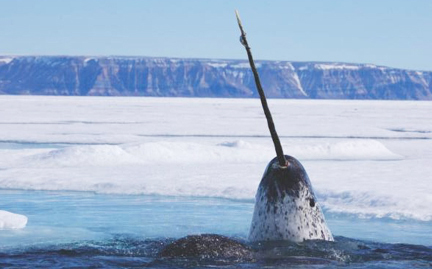 Narwhals make deep dives to feed near the bottom, likely using suction to swallow prey whole. They usually spend two months in Arctic ice-free fjords and bays and migrate to overwinter offshore in deep ice-covered habitats. The left tooth in the upper jaw continues to grow and become a tusk. Tusks are believed to play a part in breeding competition; narwhals are hunted for their ivory.